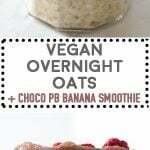 The Most Amazing Vegan Overnight Oats with Vanilla flavor and topped with an out-of-this-world Vegan Chocolate Peanut Butter Banana Smoothie! All the hearts in my eyes! Ever been in need of a healthy grab-and-go breakfast? I certainly have. There are countless mornings I’ve left the house without having breakfast because there simply wasn’t the time to prepare and eat one. Vegan Overnight Oats are my very best friend for those mornings I already know will be very, very busy. The smoothie on top is just a absolutely delicious EXTRA but not absolutely necessary. If you don’t have the extra 3 minutes to throw everything in a blender, simply make 3/4 cups oats instead of 1/3 and keep it simple. Can Vegan Overnight Oats Be heated? Absolutely! Obviously not the smoothie on top but the oats themselves can be heated either in a microwave or in a pot. I prefer them fridge-cold, though. They are absolutely delicious cold and topped with an ice-cold smoothie. Yes! Even in the winter! How Long Can Overnight Oats Stay in the Fridge? 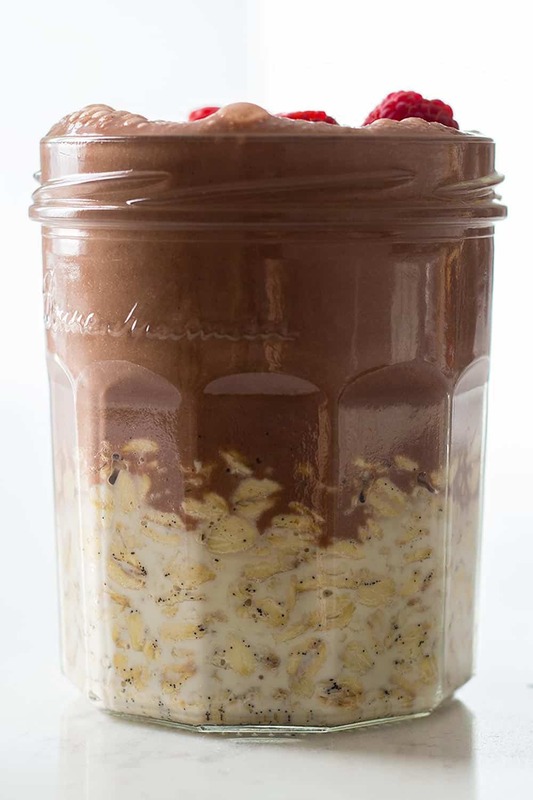 Generally overnight oats can be kept in the fridge for up to 5 days. Provided, the milk you used to soak them in didn’t have an earlier expiration date. That means, you can prepare your oats for the whole work week ahead of time and just grab your breakfast and go to work from Monday to Friday. Now, it’s probably the simplest recipe you’ll ever hit on the internet. So much so I felt like I HAD to add the smoothie on top so it looks like something mega stellar, hahaha. spice it up with any or all of these: vanilla, maple syrup, cinnamon, pumpkin spice…. next morning eat either just like that or top with: smoothie, nuts, seeds, fresh fruit…..
As obsessed as I am about everything peanut butter? Add these Healthy Peanut Butter Cups into your snack recipe collection! SO GOOD! Add oats and 2/3 cups almond milk, vanilla and 1 tsp maple syrup into a sealable jar, give it a quick stir, put on lid and place in the refrigerator for at least 4-6 hours or overnight. Add a banana to the freezer and freeze coconut milk in an ice cube tray. Once oats are softened, prepare Chocolate Peanut Butter Banana Smoothie by adding all the remaining ingredients to a blender and blend until smooth. 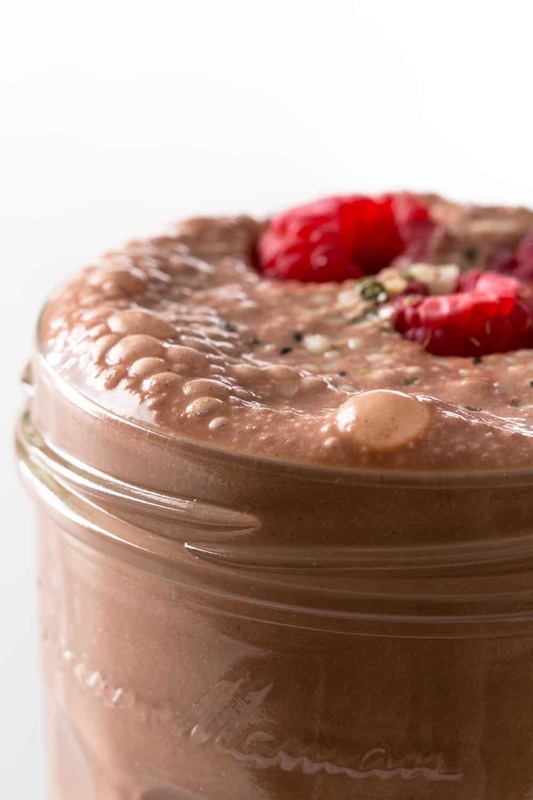 Top overnight oats with smoothie, decorate with some berries and extra hemp seeds and enjoy! 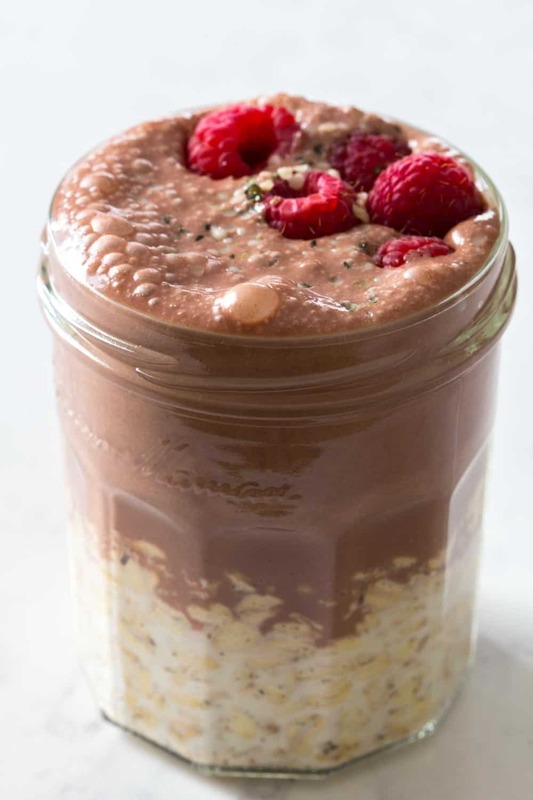 For another overnight oats flavor combo check out these Raspberry White Chocolate Overnight Oats. 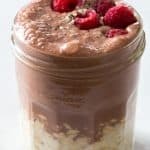 And for another grab-and-go breakfast that can easily be prepared ahead of time make sure you have a look at these Instant Pot Oatmeal in Jars. Hi Lina, the nutrition label shows calorie and nutrient count per serving. So half of all the ingredients listed are the amount of calories stated on the nutrition label. I often make 2/3 cups oats and 2/3 cups milk in a jar and put in the fridge overnight. The next day I divide into two jars, make the smoothie and top both jars with half the smoothie each. This is super delicious and I have been making it almost every day! It’s my first overnight oats recipe and most likely the last 😍 Thank you !!! OMG thank you so so much Eva!!! I’m so happy you like them :D Your comment made my day!! Do you know if the light canned coconut milk will freeze okay for this recipe? This looks great, Lorena! Quick Q: is the coconut milk the kind that’s a beverage (found next to the almond milk at the store) or the kind in a can? Gosh, these look delicious Lorena! I haven’t made overnight oats in aaaages and this is such a lovely recipe to mix my breakfasts up a bit.